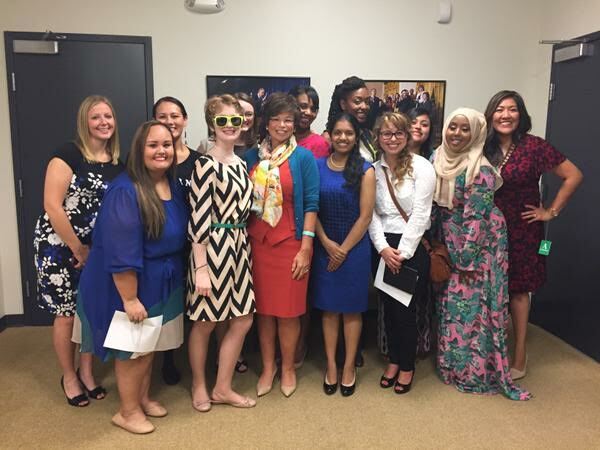 Swetha with Valerie Jarrett of the White House (center) and other Champions of Change. 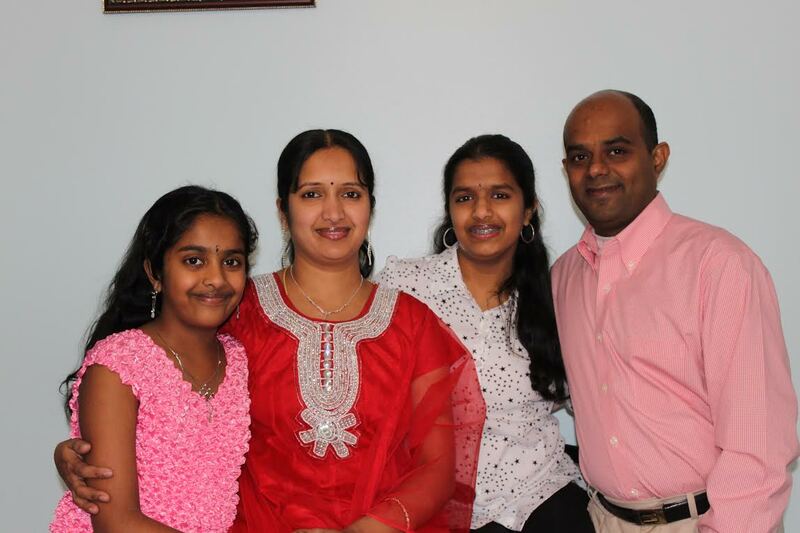 Atlanta, GA: “This is White House Public Relations”, is hardly what Prabakaran Murugaiah expected to hear as he answered his daughter’s phone and casually inquired the caller’s identity. At 15, while most teenagers are gearing up for their drivers permit, Swetha Prabarakan headed straight to the White House on September 15, 2015 as recipient of the prestigious Champions of Change Award. Swetha is among 11 young women selected for the honors. A junior at Thomas Jefferson High School for Science and Technology, Swetha is founder and CEO of Everybody Code Now!, a non-profit working to empower the next generation of youth to become engineers, scientists, and entrepreneurs. Under Swetha’s direction, Everybody Code Now! has taught hundreds of students how to code and has raised thousands of dollars for STEM activities in schools, according to a press release by the White House. The ‘Champions of Change Award’ is conferred upon young women empowering and inspiring their communities. In addition to honoring these young people for their courage and contributions, the goal of the event is to inspire girls and young women to recognize their potential for leadership as educators, advocates, peer-mentors, artists and entrepreneurs and to appreciate that they can be leaders in their own way and in their own style. In an exclusive interview with NRI Pulse, Swetha talks about her journey so far, and her future aspirations. I’m a junior at Thomas Jefferson High School for Science and Technology (TJHSST) with a focus on Computer Science, specifically application development. TJHSST is a selective Governor’s School for Science and Technology inNorthern Virginia. I am passionate about using technology to benefit the community, but love inspiring other students to do the same even more! My parents are from Tirunelveli, Tamil Nadu and both have a background in software. They run a job portal called techfetch.com, which connects recruiters and job seekers. My younger sister, Sanjitha, is in middle school. 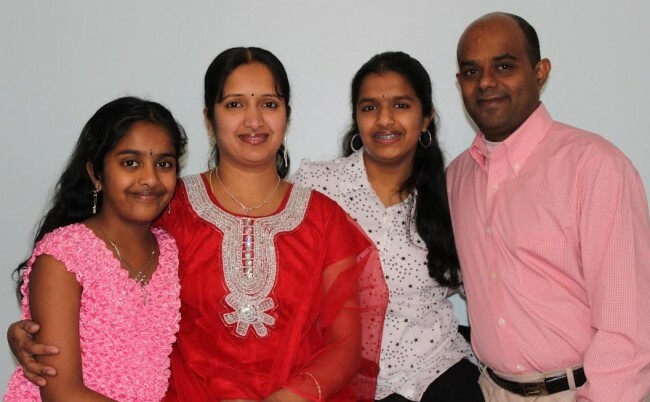 Swetha (third from left) with her family. How and why did you develop an interest in coding? And how did the idea of starting your own company come into being? I would never have entered computer science if I hadn’t seen powerful women in this field from an early age, such as my mother and my freshman Computer Science teacher. My mom has a computer engineering degree, so I grew up hearing a lot of computer jargon in the house! My Computer Science teacher, Ms.Ria Galanos, further sparked my curiosity and interest by showing me the applications of computer science (pun intended) outside of the classroom! Being able to see women I admired and looked up to in this space gave me the confidence I needed to pursue my love for computer science, and I wanted such encouragement and role models to exist for other girls, like my little sister. By 2020, we’ll have more than 1.4 million tech jobs in the US, but girls still hesitate to enter engineering and technology due to stereotypes. Without encouraging more people to enter programming, we will never be able to fill those positions. It’s crucial to include women in conversations about technology. Over half of the users of technology are women, and when they’re not creating the content or they don’t know how, they’re not going to be able to solve the issues that affect them and won’t be able to target the communities that are important to them. We lose their voices and their perspective, further lowering the likelihood of making technology accessible to all. I really wanted other girls to have strong mentors and exposure to tech the way I did, and the realization that most schools don’t offer any sort of computer science course for any students further strengthened my resolve to create a program to introduce more kids to Computer Science. It was in that moment that my non-profit, Everybody Code Now!, was born. Through Everybody Code Now!, I’ve been able to teach hundreds of kids to code and make them smile while doing so, and have also helped bring more science and engineering activities to schools. I’ve seen elementary school girls who had never heard of programming blossom into confident students building websites about their favorite sports or animals and watched the quietest students become the classroom leaders. It’s really inspiring to see the difference my work makes in the lives of children, and this motivates me to work even harder to make Computer Science education accessible for all. How do you manage your time between running a company and studying for school? Truthfully, I’m still learning! It’s a tough balancing act for sure, because school comes first. I’ve learned to stay organized (I’m a big fan of to-do lists and calendars!) and to try to front-load homework and studying if possible, especially for harder subjects like calculus and physics. Like many other teens, I’ve found the biggest challenge is not actually managing the school with my other obligations, but rather balancing everything together while still including time for sleep! I usually spend a few hours each day on week-nights doing work related to Everybody Code Now!, but a good amount of my non-profit work happens on weekends. I also have a large team of volunteers spread out across the country and work very closely with them to delegate work, which really helps all of us manage our workloads! About 99% of my team is made up of high school or college students, so we’re all under lots of pressure and manage many activities in addition to our professional obligations, but we make it a point to carve out a couple hours everyday to get our company work done. It takes tons of advance planning, organization, as well as clear and frequent communication, and I’m still figuring out what strategies work best for me and my team members, but it’s definitely possible to manage a company and school work! I love Computer Science and want to work in the field for the rest of my life, but I also have other passions! I’ve been dancing Bharatanatyam since I was about 7 years old, and completed my arangetram in Tirunelveli in August! I have always loved the fast-paced footwork and challenge of thillanas, so dance will always be a part of my life. At TJ, I dance on the Classical Fusion Dance Team and also swim for a local swim team. In addition to athletics, I travel and compete on the TJ Model United Nations team and am also a member of my school’s chapter of Future Business Leaders of America (FBLA). Before I learned to code, my medium for creation was paper! I love writing and self-published a novel when I was in fifth grade. Tell us how you found out that you were one of recipients of the Champions of Change Award. I received a phone call one late summer afternoon from an unknown number, which my dad casually picked up. The caller was looking for me, and thinking it was one of my friends, my dad was very casual and relaxed… until they said “This is White House Public Relations”! It was such a surprise, and for a few moments I was speechless. It was such an honor to be named as a Champion and to be able to join the ranks of countless others before me who have all done incredible work to create change. Tell us about your experience at the award ceremony. It was an incredible experience to be able to go to THE White House and meet the other champions, as well as high ranking white house officials like Valerie Jarrett (Senior Advisor to the President), Tina Tchen (Executive Director of the White House council on Women and Girls) and Megan Smith (United States Chief Technology Officer). Hearing their stories, as well as those of other influential women like Serena Auñon, was really inspiring. At the award ceremony, I also got the chance to hear Dr. Jo Handelsman, Associate Director for Science, speak on the importance of STEM education for girls, and also participated on a panel with other champions about leadership in our communities. I was able to share ideas and interact with great thought leaders and make a lot of connections with STEM professionals around the country to help expand Everybody Code Now! Overall, it was a wonderful experience and was one I will remember for the rest of my life! What is your message to other aspiring kids? Find your passion, and never give up. It sounds clichéd, but I cannot emphasize enough the importance of working hard and being determined to achieve your goals- be it in school, sports, or community service. When I started taking Computer Science classes, I never imagined that one day I’d be the one teaching kids to code, but my passion for service and making CS education accessible for all has taken me on this wonderful journey where I not only teach other kids to code, but have been able to inspire others to do the same! My father’s favorite Swami Vivekananda quote is “Take up one idea. Make that one idea your life – think of it, dream of it, live on that idea. Let the brain, muscles, nerves, every part of your body, be full of that idea, and just leave every other idea alone. This is the way to success.” I encourage other kids with a desire to succeed in their activities to not only be laser-focused on their goals like Swami Vivekananda says in this quote, but to also share their ideas, curiosity, and experiences with others. When we share our experiences with others and ask questions about those of others, we all learn and grow more, allowing us to succeed, give back to the community, and empower others in the way our mentors, teachers, and families empowered us. We teach our kids the 3 R’s (reading, writing, and arithmetic) so that they can be successful. It’s time the fourth R joined that list: programming. My vision is to expose every student to computer science through my organization and show them that coding is fun and applicable to their daily lives. We are increasingly dependent on technology, but very few of us are equipped to create – rather than simply use- technology. Finland has set a great example by making it mandatory that all students between ages 7 and 16 receive programming instruction through integration with other subjects from 2016, and I believe other countries can – and should- follow suit. I would like to expand Everybody Code Now! to all states in the US, as well as globally to regions where technology exposure is limited. I look forward to working with others to expand early access to technology and engineering education and also show youth that science, technology, and math are open to people of all genders and races as well.